First we look at SPY for scenarios that would have been easy to implement. Initially, we make the simplifying assumption that UR for a given month is available for SMA12 calculation and signal execution at the market close for that same month. SPY:SMA10 – hold SPY (T-bills) when SPY at the end of the previous month is above (below) its SMA10. UR:SMA12 – hold SPY (T-bills) when UR at the end of the previous month is below (above) its SMA12. Either – hold SPY (T-bills) when either of scenarios 2 and 3 holds SPY (otherwise). In other words, at least one of the signals is favorable. Both – hold SPY (T-bills) when scenarios 2 and 3 agree on holding SPY (otherwise). In other words, both signals are favorable. SPY:SMA10 and UR:SMA12 perform similarly. Either appears to increase safely the stock market participation of SPY:SMA10 or UR:SMA12. Either has not signaled a switch since May 2009. Both avoids drawdowns but does not boost long-term performance. The following table quantifies gross CAGRs, MaxDDs, annual Sharpe ratios and number of SPY-cash switches for the above five scenarios. Results confirm that Either is as good as or better than other SPY timing signals for all metrics. Using longer-term U.S. Treasuries (proxied by Vanguard Intermediate-Term Treasury Investor Shares, VFITX) as the “safe” asset boosts CAGRs of the timing scenarios by about 1% to 2%. Inserting a delay of one month between measured month for both UR SMA12 and SPY SMA10 calculations and signal execution month. This change reduces CAGR for Either to 11.4% and Sharpe ratio to 0.89. Delaying the SPY series by five trading days for both SPY SMA10 calculations and return calculations to allow time for release of monthly UR. This change reduces CAGR of Either to 12.0% and Sharpe ratio to 0.92 (but uses a slightly different sample period). In other words, execution delays to accommodate the UR release schedule materially reduce Either performance. Sensitivity testing indicates that results are similar for UR SMAs ranging from five to 12 months. 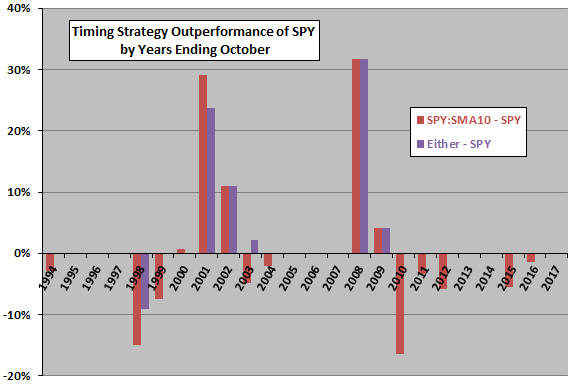 For additional insight, we look at SPY:SMA10 performance relative to SPY and Either performance relative to SPY during sequential 12-month intervals ending in October. The next chart compares the impacts of SPY:SMA10 and Either timing scenarios on 12-month SPY returns over the available sample period. 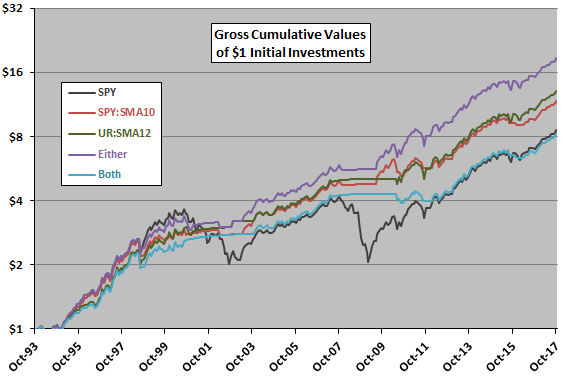 Results suggest that Either is more precise than SPY:SMA10 for side-stepping U.S. equity bear markets. However, there are only two bear markets in the sample period, limiting confidence in this finding. To check longer-term robustness of above findings, we look at the same scenarios applied to SP500. We again initially make the simplifying assumption that UR for a given month is available for SMA12 calculation and signal execution at the market close for that month. SP500 SMA10 calculations exclude estimated dividend adjustments, but return calculations do not. SP500 – buy and hold SP500. SP500:SMA10 – hold SP500 (T-bills) when SP500 at the end of the previous month is above (below) its SMA10. UR:SMA12 – hold SP500 (T-bills) when UR at the end of the previous month is below (above) its SMA12. Either – hold SP500 (T-bills) when either of scenarios 2 and 3 holds SP500 (otherwise). In other words, at least one of the signals if favorable. Both – hold SP500 (T-bills) when scenarios 2 and 3 agree on holding SP500 (otherwise). In other words, both signals are favorable. SP500, SP500:SMA10 and Either perform similarly until the early 2000s, when Either begins to outperform. Again, Either has not signaled a switch since May 2009. UR:SMA12 and Both clearly lag, with the former starting to outperform the latter around 2000. In other words, a market timer would not easily have identified Either as an outperforming strategy until well into the 2000s. The following table quantifies gross CAGRs, MaxDDs, annual Sharpe ratios and number of SP500-cash switches for the above five scenarios. Results confirm that Either is better than other SPY timing signals for all metrics. However, market timing performance statistics are generally much worse than those in the shorter tests above. Inserting a delay of one month between measured month for both UR SMA12 and SP500 SMA10 calculations and signal execution month. This change increases CAGR for Either to 12.2%, with Sharpe ratio unchanged at 0.60. Delaying the SP500 series by five trading days for both SP500 SMA10 calculations and return calculations to allow time for release of monthly UR. This change reduces CAGR of Either to 11.4%, with Sharpe ratio unchanged at 0.60. In other words, Either is largely robust to signal delays and trades materially less frequently than SP500:SMA10. Sensitivity testing indicates again that results are similar for UR SMAs ranging from five to 12 months. 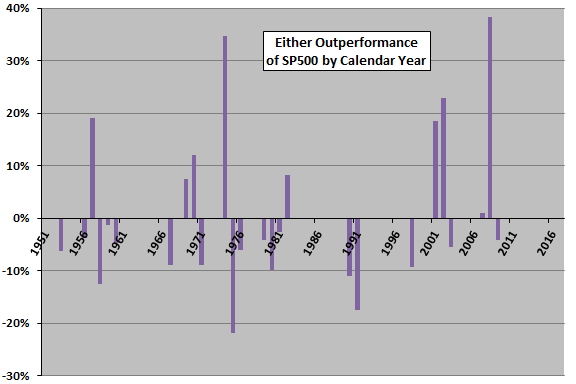 For additional insight, we look at Either performance relative to SP500 by calendar year. 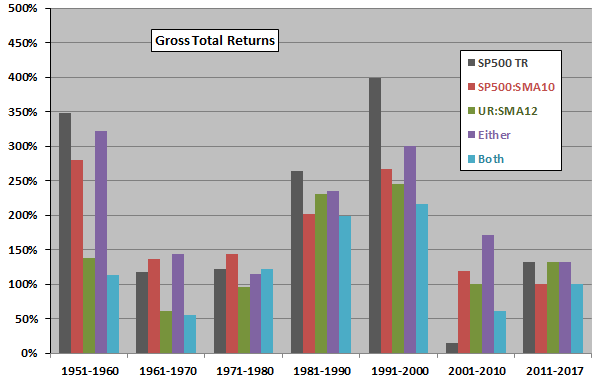 The next chart tracks annual gross return of Either relative to SP500 over the available sample period. Either outperforms (underperforms) during 9 (17) years. It appears that limiting a backtest to the segment since the late 1990s may not be representative. For additional perspective we look at returns by decade for all five scenarios. Either beats SP500:SMA10 during five of seven decades. 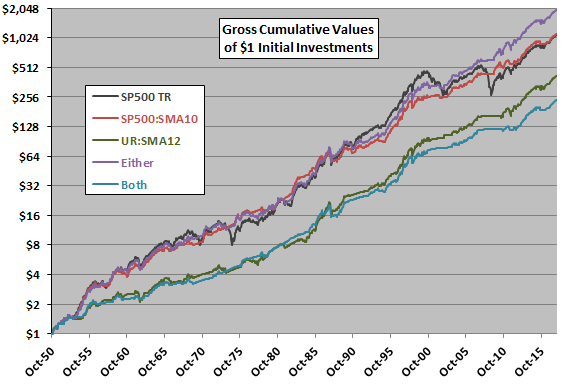 UR:SMA12 beats SP500:SMA10 during two of seven decades. Either beats SP500 during only two of seven decades (substantially only during 2001-2010). In other words, based on CAGR, Either would likely not beat buy-and-hold for U.S. equity funds within a sample not including 2001-2010. In summary, available evidence suggests that UR:SMA12 plus equity SMA10 is effective for timing U.S. stock portfolios during 2000-2010, but results for other decades back to 1950 are mixed. As noted, performance data above are gross, to the advantage of Either in comparison with buy-and-hold but to the disadvantage of Either in comparison with other timing scenarios. Modeling of SP500 dividends is crude, and the assumption of instant and frictionless dividend reinvestment is unrealistic for both SPY and SP500. As noted, many of the above calculations assume UR releases are available a few days before they actually are. This assumption has material consequences for the SPY tests. As noted, long-term tests suggest that investors would not have discovered the Either scenario until after its successful 2000-2010 decade. There may be snooping bias in selecting UR trend for combination with equity market SMA10. In other words, UR may have worked best from a set of other economic statistics. Concentration of signal effectiveness in short segments of a sample (the 2001-2002 and 2008-2009 equity bear markets) makes snooping easy. Some other combination of equity SMA10 and UR:SMA12 signals for equity entry and exit may improve results, but would impound snooping bias. As noted, using longer-term U.S. Treasuries as the “safe” asset boost performances of SPY timing scenarios. However, such bonds carry term risk (risk of capital loss) and have the tail wind of falling interest rates during nearly the entire available sample period for SPY. A general concern with backtesting investment strategies using economic indicators is that the as-revised (downloadable) economic series are sometimes not stable, including revisions made over several months and occasional overall series revisions when the government revises calculation methodologies. Such revisions impound look-ahead bias. For recent decades, there are BLS news releases announcing the unemployment rate which differ modestly from the downloadable file in a few cases. For more on this caution, see “Use the U.S. LEI for Long-term Stock Market Timing?” and “Real-time Economic Data and Future T-note Returns”.